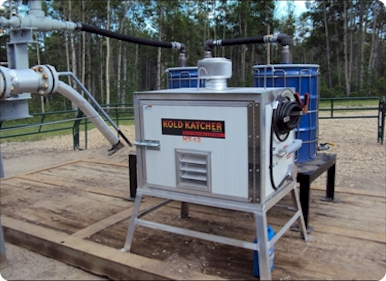 Kold Katcher Inc. and its affiliates work to provide cost effective solutions to freeze prevention at remote oil and gas well site locations where power is unavailable or uneconomic. These stand alone systems are rapidly becoming accepted as the industry standard in well site design. Our service providers can offer unmatched installation services, technical expertise, and a wide range of instrumentation and electrical support. We take pride in ensuring product arrives on time, on schedule, and on budget. We know your construction team depends on this in order for timely handover to production. The Kold Katcher pump exchange program is designed to provide our customers with a fast and convenient method of replacing their defective pumps. We understand that putting your efficiency on hold while a pump is being repaired is not an option. Accordingly, this exchange program will allow you to maintain the efficiency that you have grown accustomed to. Kold Katcher recommends servicing the pump prior to winter operations to ensure optimum performance during severe weather cycles. The exchange program is an alternative to in-field repairs. It ensures a fast delivery of replacement parts, at a fixed price. This is essential to prevent a breakdown resulting in the well site being out of service. The pumps in the exchange program have been reconditioned; all pumps have been dismantled, worn parts replaced and the housing inspected for defects. After assembly the pump is test run at the operating pressure to ensure guaranteed function and capacity. Simply fill out this shipping-label online at www.koldkatcher.com, print and attach it to your used pump that you are returning for rebuild. Once received our service department will inspect the pump, rebuild, test and ensure a timely return. It’s that easy!